Recently, LCWA team members joined client First Alert, the Chicago Fire Department and the Chicago Bulls for a “Take Charge of Fire Safety” event at William H. Brown School of Technology on Chicago’s West Side. Students from kindergarten through middle school participated in a variety of fun and exciting fire safety activities, including an obstacle course, coloring a fire safety image, lessons on planning an escape route, and “stop drop and roll” and “get low” practices. They also enjoyed presentations by the Chicago Fire Department – in full uniform! – and much more. 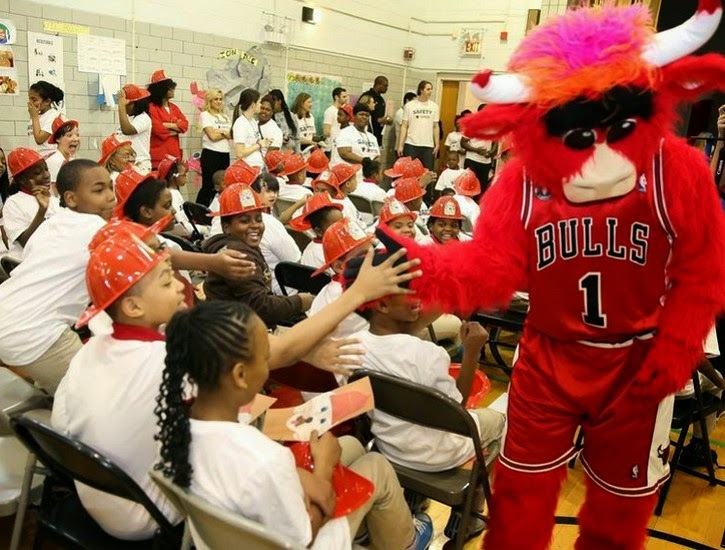 As a special surprise, current Bulls players Cameron Bairstow and E'Twaun Moore were there to encourage the students to practice fire safety, and Bulls mascot Benny the Bull had the crowd going wild the whole day. Plus, the Bulls posted a tweet and Instagram photo about the event, garnering more than 19,000 likes. The event was a major success, and LCWA was thrilled to lend a hand in First Alert’s ongoing efforts to help keep Chicago’s kids safer.